"Directing our steps towards the centre and capital of the Island, we return in the direction of Arreton, three miles from Newport, eight from Ryde, and six from Sandown. The ancient Parish Church of St. George, at the foot of George’s Down, is of Norman and Saxon architecture. It was restored in 1886 at a cost of about £2,000. It contains 250 sittings. 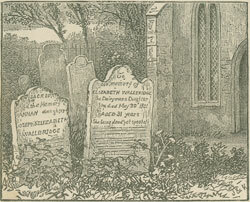 Elizabeth Wallbridge, the “Dairyman’s Daughter,” who lived in a cottage near the Wesleyan Chapel at Hale Common, was buried in this churchyard, and her gravestone is one of the objects of interest pointed out to the visitor. This good person was one of the parishioners whom Leigh Richmond held up to admiration in his famous books “Annals of the Poor.“ She was born in 1769, and died on the 30th May, 1801. The Bible Christians have a handsome Chapel at Arreton for Arreton and Horringford (the third station on the Sandown to Newport Railway is situated here). Letters arrive 7.30 a.m., and dispatched 5.30 p.m.
Haven Street is about a mile from Wootton, and has a station on the Ryde and Newport line of railway. St. Peter’s Parish Church was built in 1852, and contains 135 sittings. The Wesleyans also have a place of worship here. - Letters collected 11 a.m. and 6.30 p.m.
Merstone, a mile nearer Newport, contains a small chapel for the Wesleyans (fourth station on the Sandown to Newport Railway). Letters cleared 6 p.m. Sundays, 7.30 p.m.
Blackwater, still nearer to Newport, has a Church of St. Barnabas and a Wesleyan Chapel. (Next station on the same line). Letters arrive 7 a.m., leave 6.30 p.m.
Shide is the next calling place on the Sandown and Newport railway.